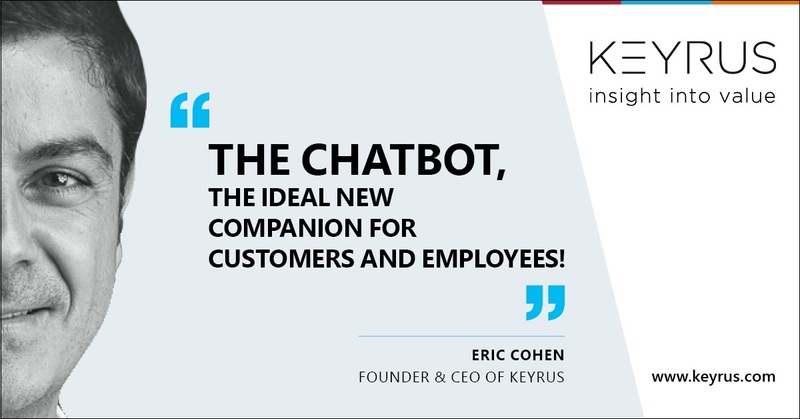 KEYRUS | The chatbot, the ideal new companion for customers and employees! The chatbot, the ideal new companion for customers and employees! It pops up at the bottom of the window when you go online to reserve a train ticket. You tell it that you want to go to «Trois», and it corrects you and asks you when you want to leave for «Troyes». What is it? OUIbot, the SNCF’s chatbot for booking train tickets. Chatbots, or conversational agents, are today attracting considerable interest, far removed from the buzz of a few years ago. There are two reasons for this. The first is technological. Our mastery of algorithms for natural language processing, together with developments in artificial intelligence and deep learning, are enabling us to shorten implementation times and devise simple and effective solutions. The second reason is the growing awareness around corporate digital transformation and the need to be quick to react, offering both the user and the employee as responsive and fluid an experience as possible. Numerous French startups rushed into this market. They certainly have some good points on their side: many of them were specialized in language learning or artificial intelligence techniques and then went down the chatbot path, by packaging the technologies they had developed. This proved a success, as symbolized by the recent acquisition of Recast.AI by the German software giant SAP. Another startup, Botfuel, offers an SDK (Software Development Kit, a technological toolbox) for building chatbots, with components focused both on language processing and interaction logic embedded in it. A distinctive feature of some players is that they have taken on board GDPR-related issues by offering a suitable technological environment, so as to free themselves from the American platforms. Specializing in conversational marketing, the gazelle company iAdvize has perfected a chatbot for brands and completed a 32-million-euro fundraising last October. Julie Desk, Do You Dream up, The Chatbot Factory, Jam… all are fast growing startups: the website maddyness.com has identified some sixty young companies working in the chatbot field, ranging from technology suppliers, through service providers, to creative agencies. Indeed, the technology is not enough in itself: optimizing the conversational experience is at least as important. It is a skilled job, in which design issues linked to these interaction mechanisms are crucial: at what point in the conversation can the chatbot adopt a more familiar tone? How can it lend emotion to the interaction? Design Thinking offers useful solutions for devising these conversational experiences. Whilst there are certainly technical and design issues to be worked through, what lies at the end of them is a growing and diversified market. The primary application is, of course, customer relations. Be careful, though, since the idea is not to do away with call centers, but rather to offer a seamless experience: the chatbot is there to provide a first line of information available 24/7, with the customer then able to go on, if need be, to contact a sales agent during the hotline opening hours. The challenge is to be present on different channels and provide a response that meets the customer’s expectations. That customer also needs to be assisted even after they have made their purchase. The travel and tourism sector in particular is investing in such an approach. KLM, which is a textbook example in this regard, has put in place a chatbot that becomes active at the end of the booking of the plane tickets, and then assists the traveller at all stages of the process: on D-1 by sending them their boarding pass, on D-day at the airport by informing them of the boarding gate and time, and at the end of the journey, by inviting feedback. All the major operators, with Amadeus at the forefront, are getting into this, so as to assist customers along the way as they use the services marketed to them. Whilst their customers clearly always come first, companies should be putting just as much effort into making their digital transformation work for their employees. As part of a mindset centered on the company in itself, HR chatbots, dedicated to salaried employees, can provide innovative approaches, using platforms offering personalized services. The aim is to respond quickly to standard questions, but also personal ones (an employee’s remaining holiday entitlement, for example), thereby avoiding the employee having to waste time finding their way through the maze on the company’s intranet. One interesting use case is the training-support chatbot that assists employees prior to, during, and especially after their training course: asking them what they thought of it, and informing them how to get back in touch with the people on the course with them, and how they can take things further… Still at company level, but this time for the purposes of communicating with partners, a conversational agent can enable a company to offer a service that is available in the evenings or during weekends. For example, in the industrial sector, companies work with tradesmen using knowledge and expertise databases that are accessible around-the-clock and managed by a chatbot, based on the principle that when a tradesman has queries, it is often in the evening, when they have finished their day’s work. This conversational revolution now affects numerous sectors of activity, and it is developing further all the time. However, it is no longer possible to see this revolution merely in terms of text-based chatbots. As an example, the AskR.ai1 startup already offers an interface, based on Artificial Intelligence technology, that is highly innovative and effective in using natural language to deal with Business Intelligence questions. We can bet, here and now, that the arrival of voice interaction will most definitely give great impetus to these everyday robot companions!